Fact, everyone loves Adele. Well, at least everyone I know. There is something about pure vocal talent that transcends music genres and allows for that rare agreement on an artist’s deservingness of stardom. Adele has this in spades. Yet, even for an artist with such hutzpah, the question always looms — have they already shown the world their best work? It’s been four years since Adele’s last album, 21, hit shelves / computers. In that time, she’s seen chart topping singles and received critical acclaim. We all know that this is both a blessing and a curse for any artist, creating amazing amounts of pressures for their next release. A few weeks ago the first single from 25 flooded internet newsfeeds and I can easily say that Adele had me at, Hello. From the soulfulness of its delivery to the lyrics that will resonate with anyone, to the expertly executed music video (yes, even the flip phone), Adele killed it. Which left me wondering, can the entire album deliver like this earworm has? When my pre-order of the album arrived, it wasn’t even five minutes through the door until the album was on the turntable and I was singing along to my already favorite track 1, Hello. Then came track 2 — could she do it? 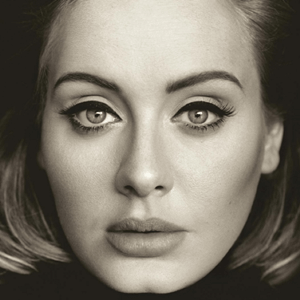 Could Adele deliver on the promise of Hello. Simple answer, a resounding, YES. For several years I have missed the pre-digital music world for the mere fact that we used to value the carefully curated album from start to finish. This is one of the main reasons I started to buy music on vinyl. I like to force myself to listen to an album through and through. In two days, I have already listened to this album in its entirety four times. I can easily say, this is a new staple to my collection. Don’t miss tracks: (in order of appearance): Hello, Send My Love, When We Were Young, Water Under The Bridge, The River Lea, Million Years Ago. This entry was posted in music and tagged 25, adele, music reviews.